For almost six years now, I have defined my “disruptive troika” as the intersection of social, mobile and cloud. Four years or so ago, I made a note to myself to add “big data” to that list. I never did that. Even as “big data” has taken off as a subject of discussion, I’ve resisted adding it to my list (although I’ve occasionally dabbled with “analytics” if only because it makes for such a good acronym: SMAC — social, mobile, analytics and cloud). Today I’m going to cement my position. I’m not going to include big data in my list of disruptive technologies. Or maybe I should, because in focusing on “big data,” so many people are missing the point. Big data has been co-opted by vendors wanting to sell more and bigger iron and more and bigger software, rather than more and better customer solutions. Let me state my biases up front. I think the world is divided into two fundamentally different kinds of people, the quals and the quants. The qualitative types would rely on judgment, analysis and experience. The quants believe there’s truth in the numbers. Despite being the son of a CPA, I lean strongly towards the qualitative side. I look for data to inform my judgments and support my positions but I begin with a hypothesis and then look for supporting (or contradictory) data rather than beginning with the data. So where does the problem lie? Or, rather, where do the problems, plural, lie? I have an immediate and strong negative visceral reaction to use of the term “data.” In about 1971, I had a summer job at IBM’s Data Processing Division headquarters at 1133 Westchester Avenue in White Plains, NY. Back then, it was fair to characterize what we did with computers as data processing. 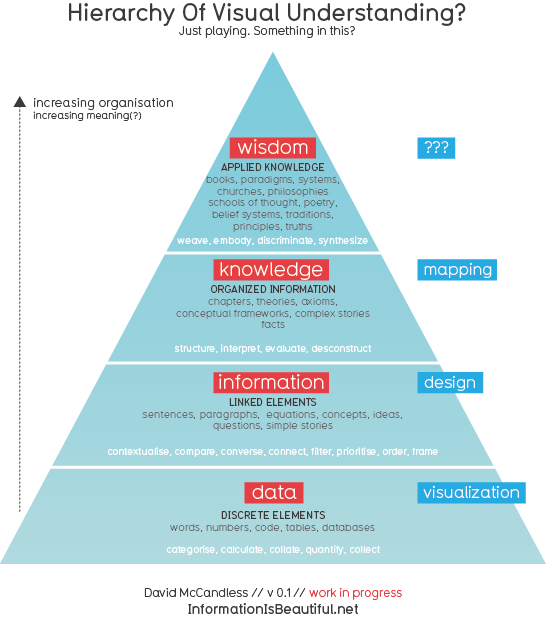 We have spent the last 40+ years trying to move up the information hierarchy from data to information to knowledge to wisdom. So how is it that after 40 years of progress, we blow everything up and talk about the lowest level, the lowest value, the largest in volume? The focus is wrong. More data is rarely the solution to a problem. In general, we find that we’ve got all the data we need, and then some. To use a politically incorrect example, on 9/12/01, we were able to trace the history of all of the terrorists back for years. We knew where they came from, what flight schools they went to, how they moved around and so on. We actually had all of that data on 9/10, and before. The problem wasn’t the data, the problem was drawing predictive insights from it. Nassim Taleb, author of the Black Swan, actually makes the provocative argument that data is toxic in large volumes, that it increases the noise in our signal-to-noise ratio. Vendors have co-opted the term to sell everything from in-memory databases to massive storage systems to faster networks to more sensors. All of these may have a role in your organization but chasing technology in the name of “big data” is just a license to spend money. Badly. Using timely data to inform critical business decisions and transforming supply chain decisions based on that. That’s what we were talking about then and what’s what we should be talking about today. The change isn’t so much in the volume of data, though that’s readily apparent, but rather the velocity and shelf-life of data. We used to receive data daily, monthly or even quarterly. Now we receive it instantaneously. And data used to have a long shelf life. Now, much of the data we can receive (e.g., location data) has value that’s measured sometimes in seconds. Use it or lose it(s value). So, what do we need to do differently? Focus on velocity, not volume. You need to shorten time-to-decision. And having reached a decision, you need to shorten time-to-evaluation. Is your strategy working? If not, change it. Quickly. Test hypotheses. The volume of data is so large that the ability to “find truth” in the data is much akin to finding a needle in a haystack. If one of the famous lines from The Graduate was “plastics,” the secret today is “mathematics.” Hal Varian, chief economist at Google and Cal Berkely academician, has said for over five years now that mathematics will be the growth profession of the century as those skills will be necessary to build the models that will make sense of, or at least test, the volumes of data that we’re generating. I’m not saying that we can’t improve business processes or outcomes. I’m a strong believer in our ability to take data and transform it into real business value, and tend to reject Taleb’s position, even while it delivers a cautionary note. But if we continue this fool’s chase for Big Data and don’t transform it into better and faster actionable insight, we will have wasted money and competitive opportunity. The focus must be on action and velocity, not volume. The question of the single converged device has been around for over 30 years now, almost from the time the second portable device was introduced (whatever that was). A few years ago, conventional wisdom was that the iPhone finally answered that question affirmatively. The iPhone was going to kill MP3 players, cameras, portable game devices and just about everything else portable. As so often is the case, that conventional wisdom was wrong then and only gets more wrong every day. Let me put it simply: the single converged device will never exist. This is not a position I’ve come to recently. I can only find reference to my position on the Internet back to 2008 but my position here actually significantly predates the commercial deployment of the Internet. In fact, it goes back to June 1987! The very first research note I wrote at Gartner back then had this exact same title. If I could actually find that note, I’d just reprint it in its entirety but the gist of the argument is that dedicated devices optimized for specific functions will always outperform general purpose devices. At sufficiently low price points, the optimized device becomes attractive. Further enhancing the attractiveness of dedicated devices is the still-vexing issue of power. If I had devices that were never power-constrained, I might sacrifice certain devices but given real power constraints, we’re often facing trade-offs between device utilization and battery life. Do you really want to play music on your phone while you’re flying if it means that you can’t make that emergency phone call when you land? The advent of cloud computing has made it easier for us to support multiple devices. In those old days, there was always a file movement challenge. Your files were never on the device you wanted them to be on, and getting them from device to device required technical expertise that was sometimes even beyond my capabilities. Now, my camera is WiFi equipped (well, one of the two that I have) and further can connect automatically through various predefined Internet providers to upload my pictures wherever I happen to be to whatever picture sharing site(s) I want to upload the pictures to. Cloud computing reduces some of the friction of adding an additional device and thus makes it easier to make a dedicated device choice. Of course, many service providers are struggling to keep up with this. My cable provider, Cablevision, will only allow me to have a few devices automatically log in to its WiFi network and my music provider, Rhapsody, will only enable me to register a few devices, certainly not as many as I have. So, what do I have? And what don’t I have? So, here’s my inventory. Desktop computer. A 23″ all-in-one device, perfect for apartment living. Laptop computer. 10.6″ Windows 7 laptop. I’ve always gone for smaller, lighter devices and with a real 8 hour battery life and under 4 lbs., this laptop has led a resurgence in Windows-based computing for me. When I say “resurgence,” I still use my portable devices for over half of the email and web browsing I do, but there was a time when my portable access was probably 90%. Phone. Samsung Galaxy S III. Big (almost 5″) Android-based phone, 4G, on Verizon. Tablet. Google Nexus 7, Wifi only. I use my phone’s hotspot capability when I don’t have Wifi access available. MP3 player. I have a Sansa Fuze device, connecting to the Rhapsody To Go subscription music service. Cameras: I have a Samsung pocket camera (Wifi-enabled), a Panasonic digital videocamera and a Fuji faux-SLR (higher end than a pocket camera but not really an SLR, but a fraction of the price). TV: I have a Samsung 46″ “Smart TV” in the living room and a 32″ “dumb” TV in the bedroom. Both are connected to TiVo. I have a Roku box connected to the bedroom TV. Game console: I’m going to hook my son’s Xbox360 to the living room TV. He has left it here since his roommates in college already have one (or maybe even several). I have a home phone system that connects via Bluetooth to my cell phone so that I can leave the cell phone charging and still walk around the apartment with phone handsets. Printer: an HP all-in-one device (inbound faxing is done via eFax; the device isn’t actually connected to a phone line). The device also has HP’s ePrint service so I can print to it from mobile devices and remote locations. I admit I’ve never done this other than to test the capability. I also have various portable charging devices so keep all these things powered up. I’m constantly reminded I should bring extra ones along, not because I need even more power but because every time I use one, typically at a Starbucks or airport, someone comes up to me marveling at my solution. I’m sure I could sell them at a huge markup. And what don’t I have? Phablet (that awkward cross between a phone and a tablet). There’s little room between my 5″ phone and 7″ tablet for the interim device. 10″ tablet. I actually had an early Android 10″ tablet (Acer A500) but given strong battery life on my 10.6″ laptop, I found I was using my laptop more and more and the tablet less and less, so when I got the Nexus 7, I gave the big tablet to my son (who uses it). Dedicated game device. I just don’t play that many games. You’ll notice I have no Apple products. That’s my political statement. I think Apple does beautiful work (although you sure have to pay a premium for that level of integration) but I don’t like the control they exert over their ecosystem. If Apple was in charge of the Internet in the early days, the Internet would look nothing like it does today, and not in a good way. I’m a believer in open ecosystems generally and I’m willing to pay an integration premium to support that belief. And I see more devices in my future, not fewer. In 1987 I wrote “the single converged device will never exist.” In 2013, 25-1/2 years later, I stand by that position. In the middle of last year, Google launched Google Fiber in Kansas City, offering a comprehensive and compelling high speed Internet and TV offering. Let’s just say for the first time ever I thought “maybe it would be good to be living in Kansas City.” OK, I got over that quickly. I had largely forgotten about Google Fiber but recently, in a group of which I’m a member, someone asked “is Google serious about getting into this business?” Short answer: no. But Google’s initiative here is instructive as part of its larger strategy. You may remember that back in 2008, Google bid on spectrum. Google didn’t actually want to own the spectrum but wanted to force the price over a threshold which guaranteed openness. Bidding $4.6 billion (yes, billion with a “b”) or more sent a message to the carriers about Google’s willingness and ability to invest to get what it wanted. Verizon ultimately topped Google’s bid, to Google’s relief, but a message was sent. Google pursues this same approach with its Nexus line of products. Their idea here isn’t so much to compete with its partners, though there’s certainly an element of that, but to set an example of what can (and should) be done. Google can use the threat of direct competition to get device manufacturers (and carriers) to support features Google feels important to be supported (e.g., NFC and payments). You could view Google’s purchase of Motorola as its expression of dissatisfaction with other handset manufacturers and the carriers, wanting more direct control of handset production. Certainly the Motorola purchase was also motivated by Motorola’s patent portfolio but the handset club was no doubt an attraction. Google walks a thin line here. Samsung’s recent embrace of Intel’s mobile platform and operating system is certainly a response to the Motorola threat. This isn’t necessarily the biggest threat in the world but Samsung is taking a page from Google’s own playbook. These megaproviders have sufficient assets to engage in high-stakes games of chicken. So, back to Google Fiber. We in the US are far from state of the art in our wired (or even wireless) infrastructure. In fact, we’re about 16th. My first cable modem deployment was around 1997. At that time, Cablevision delivered 10 Mbps to my home. Here we are, 15 years later, and Cablevision’s base service to my home promises only 10 Mbps. Still. (They’re actually delivering closer to 16 on a regular basis, but we’re hardly talking about Moore’s Law kinds of evolutionary speeds.) Why do we lag so badly behind Western Europe? One major study concluded that it’s competition that accounts for the difference. Google’s current and future business prospects are inextricably intertwined with better and faster broadband access, wired and wireless. So, if it’s competition that will lead to improvements and if competitors are loathe to push each other — that requires massive capital investment — then Google has to provide that competition. There was a day when you might have thought Verizon’s FiOS was going to be the great challenge to the cable companies. Verizon has killed that hope. So into this breach steps Google Fiber. Who here wouldn’t want that service? The message is “look what can be done”..And c’mon Time Warner, Comcast, Cablevision et al. Get with it or maybe we’ll do it in your neighborhood. And customers, demand more. It must piss Google to no end that it’s entirely reliant on two of the most backwards-thinking oligopolies in the world, cable and wireless, which exert considerable influence over Google’s future monetization opportunities (e.g., payments). So, does Google want to own spectrum? Manufacture devices? Deploy cable systems? No it doesn’t. But if it doesn’t get other parties to do things they way it wants them done, Google will absolutely do the things it needs, not just the ones it likes. Google surely has the resources. It’s sitting on nearly $45 billion in cash. That’s quite a war chest. 2012 was a strange year for me. On the employment front, I spent (way too much) time working on a start-up that never came to fruition. I then took a job that didn’t produce the opportunities either I or the employer hoped would come to pass. In all that time, I was holding off on blogging because I was saving “the good stuff” for my new opportunity. Lesson learned. My theme will, as ever, remain “disruptive technologies.” For five years now, I’ve defined this as the intersection of social, mobile and cloud. More recently, I’ve added analytics/big data into the equation (even while I think this is a grossly misunderstood area; more on that soon). I’ll be adding some new things in the mix for 2013. You can get a hint at through my regular video series, Pardon My Disruption, produced with the Stamford Innovation Center. If you’re in Stamford at noon the second Friday of every month, come on by and join our recording. Just a quick note about Pardon My Disruption. If you’ve ever watched the ESPN show Pardon the Interruption, you’ll get the idea of where I’d like to take this concept. For those of you not familiar with it, PTI is a daily sports news show hosted by Washington Post sports columnists Michael Wilbon and Tony Kornheiser. They’re, if this is not an oxymoron, two literate sportswriters and they banter about the day’s sports news. They have adopted what I have embraced as the winning strategy for dialogue/debate shows: 1/3 legitimate debate, 1/3 mutual exploration of the issues and 1/3 scurrilous personal attacks. I would love to evolve this into a full-time daily thing. I just need two things: my Michael Wilbon and someone who will actually sponsor this and/or pay me to do this. For now, I’ll just do this monthly with the Innovation Center. Hopefully I can evolve it to something more structured and frequent and then, maybe, on to its full expression. You’ll forgive my departure from technology with a brief sports reminiscence. Some of you know my long history of sports suffering. My favorite sports teams (Mets, Jets, Rangers and Knicks) have won a combined six championships in my lifetime. That’s about once every decade. Gary Carter, who passed away yesterday, was one of the faces of that fabulous 1986 Mets team. I, however, will forever have a vivid memory of him from the year before. For a long time, I shared a Jets season ticket with my friend Gary. We were at a late September game and the news was posted on the stadium scoreboard that the Mets had won and the St. Louis Cardinals had lost, pulling the Mets to within three games of the Cards…with the Mets heading to St. Louis to play three games October 1-3. Gary turned to me and asked “do you want to go to St. Louis?” When I opined that he was crazy, he noted to me that People Express had just begun flying to St. Louis and we could get, as I recall, $89 round-trip tickets to St. Louis. People Express was really the first no-frills air carrier, known affectionately as “People Distress.” In the era before cell phones, Gary went out to the concourse and called St. Louis and sure enough was able to secure two tickets to the three games. We figured we’d stay in St. Louis as long as the Mets won. Well, they won the first game, a remarkable extra innings affair culminated by an absolutely titanic blast by Darryl Strawberry that actually took out a few bulbs in the stadium scoreboard, bulbs that hadn’t been replaced by the second game. St. Louis fans are just disgustingly nice. Here we were, two obnoxious Mets fans screaming like hell for the Mets and some St. Louis fans actually came up to us — we were sitting in the last row of the stadium — to apologize for the rudeness. We assured them that if this were New York, the reaction would have been more, um, exuberant. Off we trod to game three the next night, toting our banner which we mounted to the back screen fence of the stadium. Again, we were in just about the last row of the stadium. As the game went on, the Cardinals took a 4-2 lead into the top of the 7th. While we’re sitting there, some guy comes up and menacingly asks “whose banner is that?” We figured he was some stadium official, come to tell us to take the banner down. We admitted it was ours whereupon he said “Congratulations, I’m Dave Charity of WPLJ and you win” and, as I recall, handed us 10 $100 bills. Of course, all this was happening at a tense moment in the game, the season. The Mets were rallying and had two men on with two outs and up came Gary Carter. He was an MVP candidate at that point (he ended up finishing 6th). This was the moment he could have won the MVP, catapulted the Mets into the lead and bring them to the playoffs. Of course, he popped out. And in the 9th, with Keith Hernandez on base and two outs, with a chance to tie the game, Carter flied out to end the game…and effectively the season. To this day, Gary and I blame ourselves and WPLJ for the loss, though, and not Carter. It was our rooting and intense concentration that was responsible for the Mets’ success. During that 7th inning at-bat, our attention wavered. Instead of focusing on the game, we were focused on our good fortune. In fact, our attention continued to waver because we flagged down the first beer seller we could and bought his entire tray of beer. To this day, I’m sure there are a few St. Louis fans who think that some of those New Yorkers have a pretty good sense of humor as we shared the beers with whomever in our section wanted one. I’m sorry I let you down in your moment of need, Gary Carter. I never did have a chance to say “I’m sorry.” But now you know. I hope it gives you eternal peace. I have been away from blogging for too long. I won’t go into the reasons why — suffice it to say, I’m no longer saving anything for future commercial opportunities — but it’s nice to be back. What has spurred this posting is a response I received from an anti-SOPA/PIPA message I sent to one of my (Connecticut) Senators, Richard Blumenthal, who as the state’s Attorney General was a fierce advocate for the consumer. He in fact had been favorably inclined towards these terrible pieces of legislation although, like many in Congress, was clearly swayed by the outpouring of rational arguments against these bills. I’ll post here the Senator’s reply to my letter. At the end, he asks a very interesting question, and I’ll also include my response here. Bottom line, I don’t think we need legislation to combat piracy. I think industry has all in its power to build solutions that the market will embrace. However, to do so will shift the economic value from the label to the artist/performer…and the industry will fight that to the bitter end, relying on legislative efforts when its other efforts fail. Thank you for your thoughtful message regarding the Protect IP Act. I appreciate hearing from you. Over recent weeks, I have listened closely to the concerns you and others have voiced regarding the Protect IP Act, as well as the Stop Online Piracy Act, which was being considered in the House of Representatives. My views have evolved as I have come to understand and share such concerns. While I remain committed to stopping online piracy, I will not vote for any legislation that could hinder innovation, freedom of expression, the right to free speech, or the architecture of the internet. I am grateful to you and others who have reached out to share insights and perspectives, which have been immensely valuable, and which have helped inform my thinking on this profoundly important issue. Many have cogently pointed to flaws and overreaching in the Protect IP Act. As I have said, my best ideas come from listening to the people of Connecticut, and this matter is no exception. The challenge for all of us — and I welcome your further views on this issue — is to protect American property and jobs, but also promote American creativity and innovation, safeguarding the rights of everyone who uses the internet in good faith, without intent to engage in illegal acts. If you think we can eliminate online piracy, what do you see as alternatives to the proposals in the Protect IP Act, and how can they best be implemented? I hope you will visit my website and share your thoughts and suggestions. I look forward to hearing from you. Thank you again for contacting me. “Thank you for your thoughtful response. You ask, perhaps unintentionally, a key question: “If you think we can eliminate online piracy…” That, of course, is a fundamentally absurd notion. We can not eliminate piracy. More importantly, though, going forward the key question we must ask is “is this a matter for governmental regulation or is this a matter for markets to resolve?” I would argue that those who are most strongly advocating for governmental involvement are those who have been unwilling, not unable, to pursue free market solutions. Think back, if you will, to the “heyday” of illegal Napster. Why is music piracy so much smaller of an issue today than it was then, when the digital landscape was dominated by pirated music? It’s because Steve Jobs dragged the record labels, kicking and screaming, into this new world. To this day, however, the labels retard every attempt to create rational markets for digital music with insane licensing agreements, byzantine partnerships and user-hostile approaches. Industry has within its power the ability to create solutions that meet the goals of users, artists and other players in the value ecosystem. They have resisted, however, in my opinion, because this new world marginalizes their role in the economic value chain. What is the role of a label? It identifies talent, creates awareness and secures distribution. Well,in this new world, distribution is universal, awareness is best done by word of mouth and talent is identified via a crowd-sourcing model (up to and including approaches like American Idol). The labels are clinging desperately to a world where they maintain primacy and if the market itself is not going to produce that outcome, they’ll rely on legislative approaches under the canard of piracy. I think we have seen that the vast majority of consumers want to be law-abiding. That industry continues to fail to produce products that meet that desire is a pox on their house. Instead of taking the step of criminalizing rational behavior, let’s instead encourage industry to come up with innovative solutions that meet the market needs. Have they truly done that? I laugh at that notion. There has been precious little innovation in the pricing, packaging and marketing of digital solutions. Instead the industry moans about piracy and seeks legislative help. Around 15 years ago, I was on stage at the @d-tech conference with Strauss Zelnick, then CEO of BMG Music. (Parenthetically, I was unable to find a Wikipedia page on Zelnick, which is almost unprecedented for someone of his stature in my experience. )We talked then about the real reasons for the industry fighting Napster and the like. It wasn’t so much that there wasn’t money to be made. In fact, we modeled a scenario where the industry actually grew significantly. Rather, it shifted the economic power base away from the record labels and that’s why they continue to fight things so vehemently. Of course, that’s not what Zelnick said…but anyone who was in the auditorium that day surely knows that’s what he really was conceding. Here we are, 15 years later, and the most the industry has come up with is 0.99/song? The only innovations in approach have come from startups who are subject to fierce legal action and only through perseverance have been able to bring their solutions, incomplete though they may be, to market. Can you imagine how much better things would be if only the rights-holders would facilitate it? But until they lose all hope of a legislative hail mary, we are left with this sorry status quo. Google/Motorola: Good for Android. In fact, necessary. Google’s decision to buy Motorola Mobility for $12.5 billion is one of the more nuanced acquisitions we’ve seen in a long time. There are certainly a few negatives to the deal but the positives are so overwhelming as to render those negatives largely irrelevant. Sure the licensees can’t be happy about having to compete with their technology provider. That’s never a good situation. However, I think Google should largely be able to assuage their concerns and in fact, I don’t think HTC and Samsung are the biggest target of this acquisition. Google continues to need them to provide a rich ecosystem of devices behind Android. And besides, Samsung and HTC are kind of stuck. What are they going to do? Throw their weight behind Windows Mobile? That situation is no better and Google’s acquisition here may even force Microsoft into buying Nokia or RIM. WebOS? Nope. This is still their best bet and they’re likely to be able to compete effectively with Google/Motorola to deliver compelling handsets, assuming some semblance of a level playing field, which I expect to be the case. Google’s acquisition here really targets two other segments of the mobile space: Apple and the carriers. The patent battle with Apple is now on much more even footing although the real winners here are likely to be the lawyers who now get to sort this all out. As regards the carriers, Google had to be envious of Apple’s ability to pretty much call its shots with regard to full hardware and software design. Google had to do much more to kowtow to the carriers’ backwards notions of how things should be brought to market. Now Google can deliver against its own vision even while Samsung, HTC and the others can get cozier with the carriers, dealing with the double-edged sword of carrier favoritism. That favoritism clearly benefited Motorola with the original Droid launch. Now we’ll get to see how much that might benefit HTC and Samsung as against Google’s unified vision but potentially weaker carrier relationship. Google has clearly been trying to develop direct customer relationships beyond the control of carriers; now they have that chance. Underappreciated in this deal is Motorola’s cable set top box business. Motorola and Cisco/Scientific Atlanta are the dominant leaders in this space. (I actually worked for General Instrument back in the middle 80’s, before Motorola acquired it.) Google clearly continues to struggle with Google TV and its partners have recently slashed the prices of their devices, down as low as $99 (from $299). All of a sudden, Google TV now has a major market share. Of course it will take years for this to fully manifest itself as cable box life cycles are pretty long. (When’s the last time you changed cable boxes? Probably when you moved, if then.) But the discussions Google will have with cable companies and TV manufacturers will change considerably after this acquisition. All of a sudden, Google means more to them. This might actually drive some business to Cisco but it also present Google with a unique opportunity to reshape its TV and media strategy. I’ll have to give this one more thought. Bottom line, this was a great and necessary move by Google. The Android partners are not as happy as their press release comments indicate but they needed patent protection from Google and this is the best possible way Google had to accomplish that. They can still compete effectively and anyhow, they don’t really have a choice.